Great event for the little ones! Join us, Saturday, April 13th from 12-2pm for our Annual Spring Extravaganza! 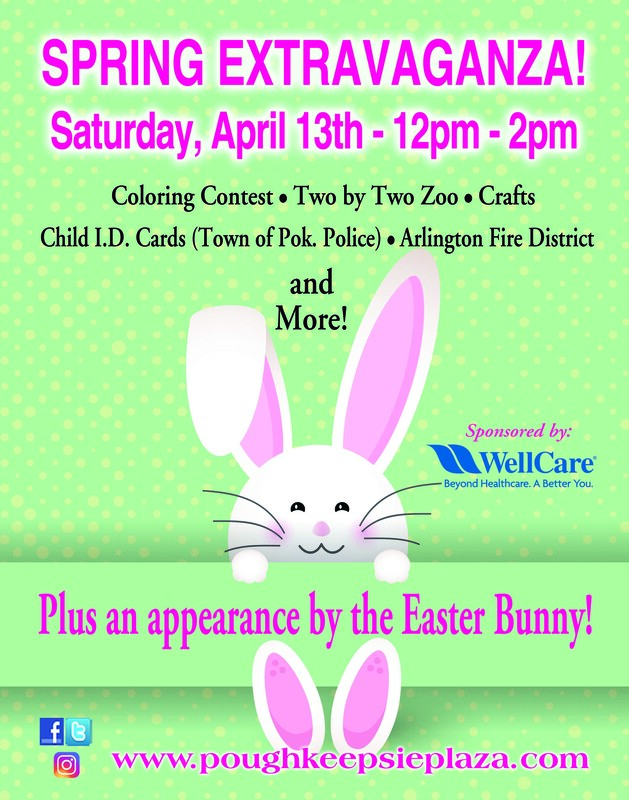 *There will be no egg hunt this year, however, we will have plenty of free activities for the little ones! Enjoy an indoor exhibit by Two By Two Zoo to include a kangaroo, goats, rabbits, a bearded dragon, baby chicks, and ducks and more! Enter a coloring contest or make a craft with Joann Fabrics. The Town of Poughkeepsie Police Dept. will be here as well conducting Child ID cards and the Arlington Fire Department will be distributing fire prevention materials for the kids. Get your face painted while waiting for a visit from the Easter Bunny where you will have an opportunity to snap a picture or two. This event is sponsored by WellCare- be sure to stop by their table for health care information.